Healing Hands is partnering with East Tennessee State University Dental Hygiene Program and Appalachian Miles for Smiles for a FREE Dental Hygiene Day on Friday, April 20, 2018! Appointments are from 8:00 AM to 3:00 PM and can be made by calling (423) 652-0260 ext. 2. Thank you to The Buddy Crump Insurance Agency, Inc. for sponsoring our free Dental Hygiene Day! 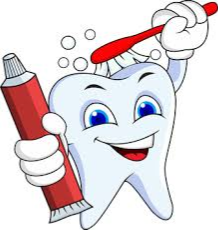 Please note: appointments are for those who don’t have dental insurance and aren’t already a Healing Hands patient. Join us for an Evening in Bali! Our 13th Annual Fundraising Gala will be held at The Lodge & Pavilion at The Olde Farm on Saturday, September 29, 2018. This event is our largest fundraiser each year! We are currently accepting reservations for table sponsors and program ads. 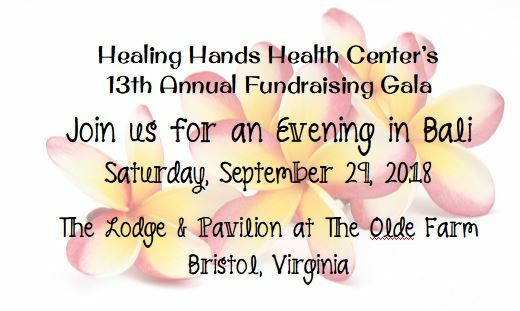 Please contact Allison at allison@healinghandshealthcenter.org or (423) 573-4327 for more information on sponsorship levels. We appreciate your support! 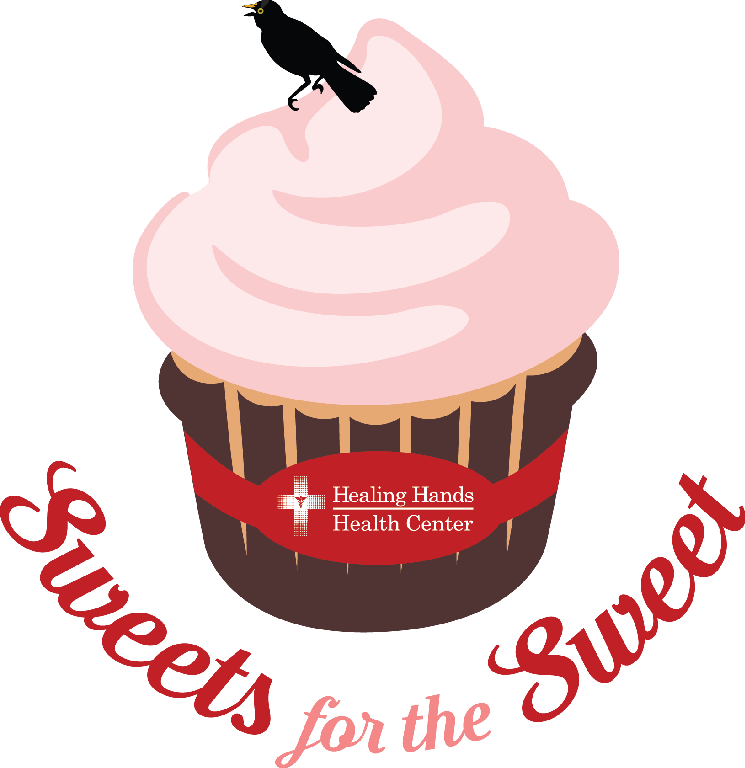 Thank you to everyone who helped make our 2018 Sweets for the Sweet Fundraiser such a success! Thanks to your support, we were able to raise $27,000 to help provide our working uninsured neighbors with vital medical and dental services. FUN FACTS: We had more than 70 volunteers helping us this year, and 40 of those were cupcake delivery drivers! Our celebrity drivers included WCYB news anchors David Boyd, Dave Dierks, Casey Goetz, P.J. Johnson, Julie Newman and Rebeca Pepin! Special thanks again to Blackbird Bakery for donating the cupcakes! 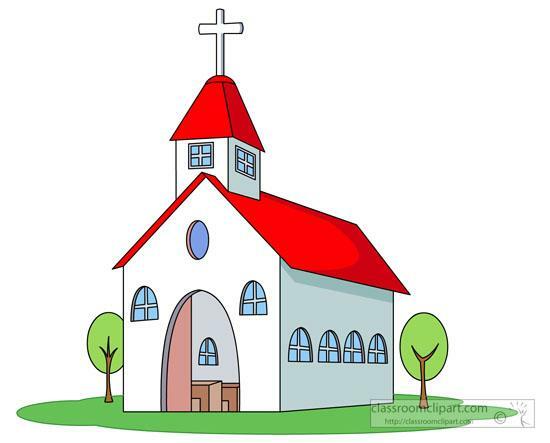 Thank You to Local Churches! Every year, local churches support Healing Hands with donations of time and money to help us further our mission. As a Christian ministry that was formed by church members more than 20 years ago, we are grateful for your continued generous support! We would love the opportunity to speak to your church membership or groups about the work we do at Healing Hands. If interested, contact us at allison@healinghandshealthcenter.org or call us at (423) 573-4327. 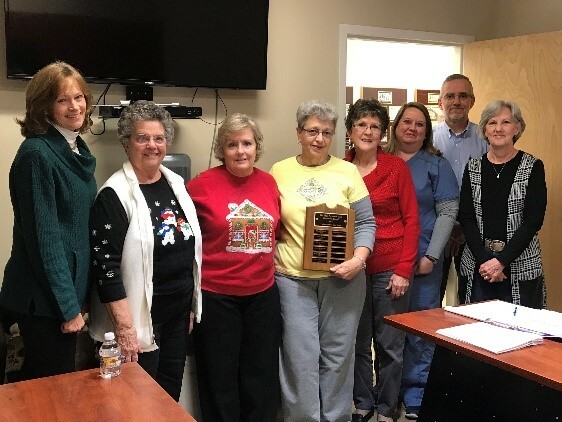 A big thank you and congratulations to our 2017 Jean Ferguson Poole Volunteers of the Year for their tremendous help with obtaining medications for our patients! Together with their help we have given over $25,000,000 worth of free medications! 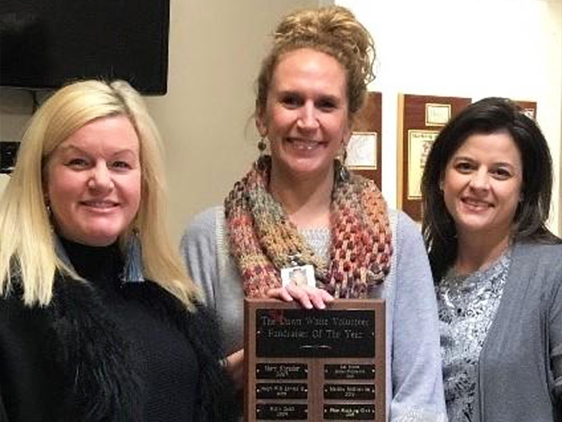 Our Director of Development, Allison Mays, awards Mary Caroline Mumpower and Beverly Gurley with the 2017 Dawn White Memorial Volunteer Fundraisers of the Year for their tremendous help with our gala. We appreciate you so much! Become a Volunteer! Support & Donate Now!